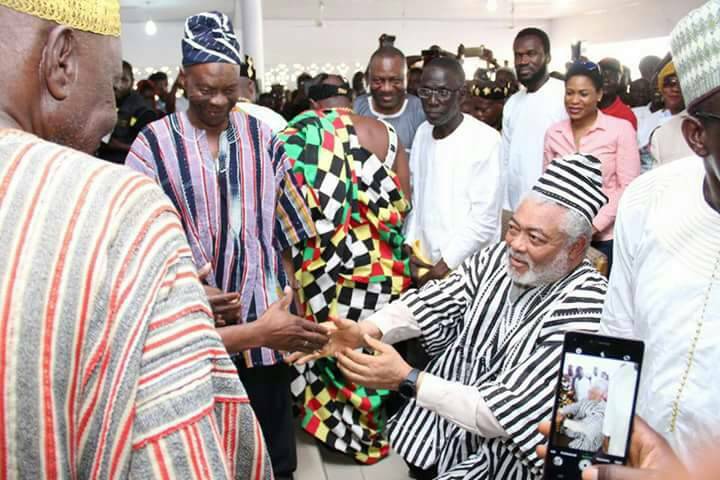 Former President Jerry Rawlings has congratulated Yaa Naa Abubakari Mahama and the people of Dagbon for the historic and peaceful coronation of the new Yaa Naa. On the occasion of the outdooring of Yaa Naa Abubakari Mahama as the new King of Dagbon I wish to congratulate the King and people of Dagbon for this historic achievement. The people of Dagbon have gone through a difficult and painful period since 2002 and it is a sign of great maturity, tact and patience that the process of the burial ceremonies of the Yaa Naa and the investiture of the new Overlord have progressed in relative peace. I also commend the committee of eminent chiefs namely the Asantehene, Otumfuo Osei Tutu II, Yagbonwura, Tuntumba Boresa Sulemana Jakpa I and Nayiri, Naa Bohogu Abdulai Mahama Sheriga for their painstaking efforts in bringing about this welcome development. Peace will be perpetuated in Dagbon if the traditional leaders and people of Dagbon commit to the fact that they are brothers and agree to live in an atmosphere of justice, peace and harmony. Too many years have been wasted in a state of suspended conflict due to the lack of justice. It is now time to dedicate yourselves to peace and development, mindful of the complexity of your history. Let me also commend President Akufo Addo for his dedication to the work of the eminent chiefs and all who in diverse ways worked towards today’s climactic event. I pray the government and the security agencies will continue to work in tandem with the new Overlord and the people of Dagbon to ensure and maintain lasting peace and security. I wish Yaa Naa Abukari Mahama many years of wise and strong leadership and pray that peace and justice will prevail in Dagbon. JEAN MENSAH, BOSSMAN PLOTTING WITH AKUFO-ADDO AND THE NPP TO RIG THE 2020 ELECTION ?